Back in the days Muridae Market use to be crowded with travelers from all over the kingdom, all the shoppes here were famous among the entire kingdom. However one day a huge army of the Marching Flame attacked, they made devastating damages to all the shoppes in the Muridae Market. Today Muridae Market is deeply in needs of top rank hunters to recover the damaged shoppes by hunting the mice wondering around the market and collect the rebuilding materials for the shoppes. With all these materials, the shoppes can be rebuilt. Physical and Tactical traps are effective here, use your strongest one out of those two power types. For choice of cheese, Gouda works great here, an economical choice would be Brie. 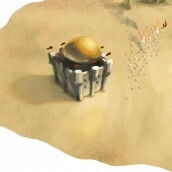 Tho Super|Brie+ give the best attraction rate and only it can attract the Desert Architect mouse. To keep track of your progress on your collection of building materials, check out the HUD . Hovering over the image of the shoppes will give you an indication of how many materials you have collected. As soon as you collected enough materials a word “ready” will appear on top of the shoppe icon and now you can click the “rebuild” button to rebuild the shoppe. Note that before you have rebuilt the shoppes, you can still check what the shoppes are there to offer. However none of the items in the shoppe are available to be purchased until they are being rebuilt. Certain materials that are required, are only available after you have rebuilt some of the shoppes. Follow the following order to rebuild all the shoppes. Note: You may start building either Cheese Shoppe or General Store first, however I recommends building Cheese Shoppe first as it allows you to restock cheese without having to move to other areas. Not recommended as Sphynx Wrath is far better. Recommended if you still haven’t obtained your Sandstorm MonstroBot, it’s far more powerful than the Enraged Rhinobot. This base has the highest luck out of all bases so far, however it’s lacking on power bonus. Therefore this base is only effective pairing with a high luck trap. Papyrus and Scrap Metal both are dropped by Blacksmith mice, but you are required to arm Artisan Charm (From Charm Shoppe here) to attract them. The luck and power charms are quite expensive, they are not really worth the gold unless you need them for some very difficult mice. Last a little warning for you hunters, the Market Thief appearing in this location will steal supplies. So good luck! Note: Little tricks to obtain Papyrus faster, if you have an excessive amount of Limestone Bricks, go to the General store and exchange Limestone Bricks -> Coconut Timbers or -> Shard of Glass then go back to Charm Store and convert some more Artisan Charms. Make sure you have a good balance of Limestone Bricks, Coconut Timbers and Shard of Glasses. As 1 of each are required to get Artisan Charms. Also keep in mind the amount of materials needed for rebuild Cartographer. Don’t over exchanged the first 2 materials. Nice post. I was checking continuously this weblog and I am inspired! Extremely helpful information particularly the final section 🙂 I take care of such information a lot. I was seeking this particular info for a long time. Thanks and best of luck. A little correction made here, to rebuild general store need 60 limestones bricks not 50. Is it easy to catch Glass Blower, Limestone Miner and Lumberjack mice? Those who drops the 3 things as in using Enraged Rhino with SJB, Gouda and Prospector? web and on web I found this site as a finest web site for latest updates. Do the tiles need to be removed, replaced, upgraded. Mark the river amount of the pool on the outside of the bucket or elsewhere.